As leading UK specialists for onsite training, we can deliver Microsoft Excel courses at your own offices for considerably less than the cost of public events. Our trainers are qualified to provide training from Foundation level right up to Advanced and VBA. 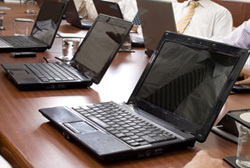 We provide all the necessary training equipment, so that you can use virtually any office as a computer training suite for the day. We can also supply laptops if required. The typical cost for a public Microsoft training course is around £300 per person, whereas our onsite training rates can cost you as little as £55 per person (based on a group of 10 delegates). Please see our Onsite Training page page for full details. Call us on freephone 0800 2922842 to discuss your requirements or visit our Contact page to email. Please note that these are the full rates per group, not per person and we do not charge travelling expenses. All prices are + VAT. Prices for public Microsoft Excel courses are now in the region of £300 + VAT per person, so onsite training clearly makes good financial sense. You would only need 2 employees to save money and the daily rate rate works out even cheaper as you add more staff members. In addition, you don’t incur travelling expenses or wasted time. With an onsite Company Excel course your employees benefit from tuition which can be tailored to their specific needs. Down-time and disruption to your business is minimised and your staff learn a set of valuable skills which will make them more efficient in the office. For further information on excel training courses in Glasgow, please visit our contact page. You can also call free to discuss your requirements on 0800 2922842. For more details or to book an Excel training course in Sheffield, please visit our contact page. Alternatively you can call us free on 0800 2922842. Please note that these rates are per group, not per person. All prices are + VAT and include personal Microsoft Excel training manuals and course completion certificates. These rates are per group, and include personal Microsoft Excel training manuals and course certificates. All prices are +VAT.